A minority have implausibly puritanical levels of integrity. A few others draw a fuzzy line somewhere between illegal parking and having your child tell the caller you are not at home. Most people, though, only refrain from money-making civil and criminal misdemeanours when the odds of capture outweigh the potential reward. And weighing those odds accurately tends to be a dynamic calculation - particularly when political administrations change. Just ask Danielle "not such a secure line" Chiesi. So is the Galleon wiretap-based prosecution a hammer blow for integrity? Will it "change behaviour" in the ethical sense that those words might be interpreted as meaning? Doubtful - but it is a leaf taken from the syllabus of the Genghis Khan School of Market Administration: blind all but one in the village and send the mono-eyed survivor down the road to the next settlement with the news. For the hell of it, compare and contrast the size and scope of the SEC (which has not exactly been setting the regulatory standard recently) prosecution with the efforts of the UK's FSA. The FSA, as of last March, now has one (as in "there's only one FSA") successful criminal conviction to its credit. It concerned a small-cap company's counsel, his father-in-law and a total insider profit of £48,919.20 (equivalent, for info, to an off-plan garden flat in extradition treaty-lite Northern Cyprus). One suspended sentence later (father-in-law was 75, poor chap) and eight months in jail for the brief and the FSA gets to give speeches titled "Delivering Credible Deterrence". Alright - it may be early days since that "success" but the FSA's own Annual report (page 34) shows that “abnormal” share-price movements - possible signals of illegal insider activity - rose year over year in 2009. As, in fact, they have done every year since 2005. Incredible deterrence. As a footnote, of the twenty-odd civil penalties the FSA has imposed since its 2004 creation not one has been against a major investment bank. Very ethical bunch, clearly. 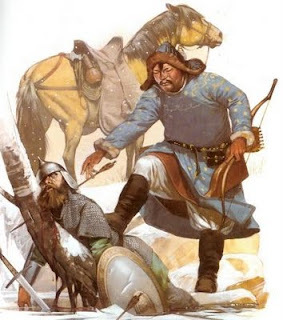 Or maybe, in its current political fight to justify its existence, the FSA ought to do a Genghis. Its limp history would set up the impact rather well. This crisis was, first and foremost, about the unsustainability of macro imbalances – imbalances within and between nations – as well as about the egregious flaws in policies, regulatory structures, and risk-management practices that allowed these imbalances to take the world to the brink. Recent policy initiatives offer little reassurance. Cash-for-clunkers in America and cash for roads in China are emblematic of a penchant for quick-fix stimulus actions that risk compounding existing imbalances. US authorities cannot resist opting for another dose of excess consumption – despite the fact that the consumption share of real gross domestic product remains at a record high of 71 per cent. Nor can the Chinese wean themselves off investment-led growth – even though the fixed investment share of their GDP appears to have surged beyond the already unprecedented reading of 45 per cent in mid-2009. Far from rebalancing, an unbalanced world once again appears to be compounding existing imbalances. I had been wondering what this situation as described by Mr Roach reminded me of. Then it came to me: the poor facsimiles represented by any number of karaoked covers. Worse, the originals themselves often had few redeeming qualities. Consider it the Mariah Carey Effect.